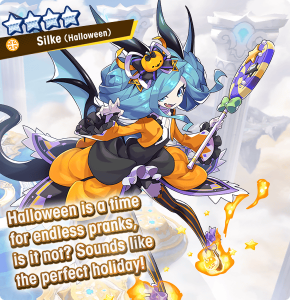 The Halloween Fantasia summon showcase opens Oct 16 23:00(PT)! 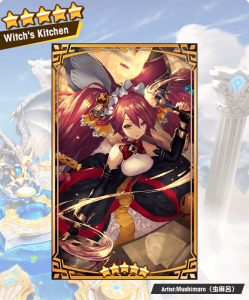 Event-exclusive adventurers, dragons, and wyrmprints will make their debuts in the summon showcase. Also, featured adventurers, dragons, and wyrmprints will have increased appearance rates! a little embarrassed to actually wear it. Which of these feelings will win out in the end? Deal light-based damage to enemies directly ahead! The skill gets stronger with each hit! and fills the user's skill gauges if the attack connects. Increases attack skill damage by 30%. Speeds the rate the mode gauge decreases by 35%. Believing Halloween costumes to be fashionable, Silke was happy to dress up for the party. gleefully pondering what tricks to play. Deals light-based damage to surrounding enemies and reduces their strength! If the user is attuned to light, increases strength and HP by 20%. Increases Tricker Treat intake for clearing quests by 100%. 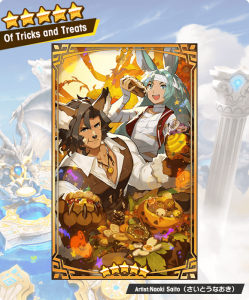 Wyrmprint abilities that increase Tricker Treat intake for clearing quests will no longer be in effect after the event Trick or Treasure concludes. 5. Only diamantium (purchase required) can be used for Daily Deals. Daily Deals reset every day at 23:00. 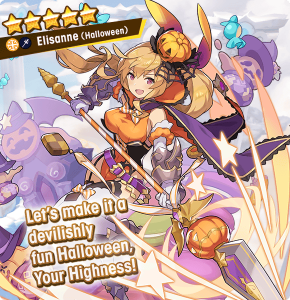 The ability descriptions of Halloween Elisanne and Halloween Silke have been appropriately corrected.